Its nonelastic 1:1 impression paste formula is ideal for taking accurate, detailed impressions of edentulous soft tissues. Thixotrophic paste flows easily under light pressure so soft tissues are not distorted. Nonelastic material does not transform when the tray is removed from the mouth. 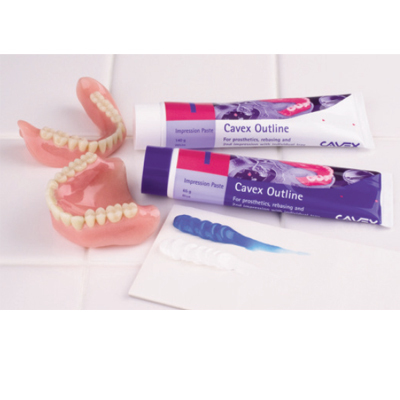 With Outline’s intraoral snap set, moisture within the mouth accelerates the curing to deliver a firm, fully set impression in about 3 minutes.